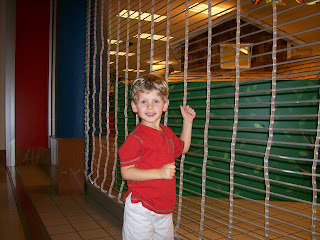 Dawson and I spent some time at The Woodlands Mall this week. It was a very nice outing and lots of fun. 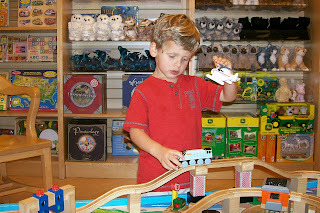 Playing with the trains (and helicopter) at the train table at Barnes & Noble. Knocking on the gate at the children's museum as we wait for it to open. 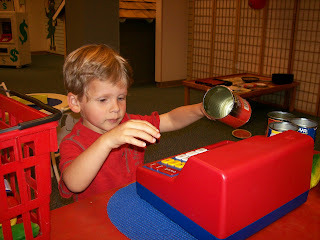 Playing cashier at the museum. 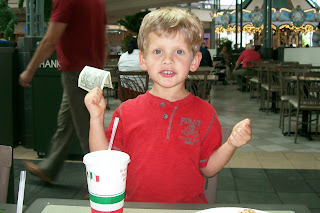 Eating some pizza at the food court and holding his dollar in anticipation of riding the carousel. Playing with the fun projector game. 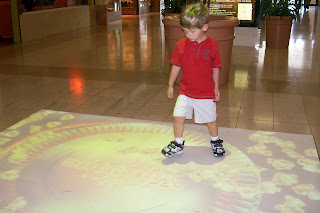 This particular game was popcorn kernels that pop whenever you step on them.